"All's fair in love and basketball." When I first heard the premise of Gina Prince-Blythewood's Love & Basketball I was a bit skeptical. To be honest, a love story set against my favorite sport wasn't intriguing to me; I was certain that too much emphasis would be put into the love aspect with too little basketball. I am very happy to say that I was completely wrong—Love & Basketball is as much a love story as it is a sports film and it a good one at that. When the film opens Monica Wright (Latham) and Quincy McCall (Epps) are neighbors in the early 80s. She has dreams of becoming the first woman to ever enter the NBA and he is determined to do better in the NBA than his father, Zeke (Haysbert), who plays for the Los Angeles Clippers. Through the course of the film we are shown different stages in both Monica and Quincy's lives. The first act is set in 1981 when Monica and Quincy are children and we see their relationship start to take shape. The second act skips ahead several years to high school, when Monica and Quincy are stars in the basketball program. When it comes to choosing a college, she has to wait to hear from a recruiter while he has his pick of any college in America. The final act of the film covers struggles with college, family and ultimately the love that the two have for each other. The downside is that the story has an all-too-familiar arc to it. While the sports scenes are at times unpredictable, the love story follows the same pattern as most romantic films do. That is not to say that the screenplay by Prince-Blythewood does not have any redeeming qualities. She has creates two very interesting characters for the leads. Both Quincy and Monica are fully realized roles, and there is a nice chemistry between the two them. The performances by Lathan and Epps carry the film to great benefit. The script needs these two people to care for each other and for us to want them to get together. Both Epps and Lathan succeed in making the viewer care for them and how their lives will turn out. Supporting parts by Dennis Haysbert (Major League) and Alfre Woodard, making her second basketball film if you include Blue Chips, are done well and each has some nice moments in the film. Image Transfer Review: The 1.85:1 anamorphic transfer is not as good as other recent outings by New Line but it is still above average. Black levels and flesh tones are each perfect; sharpness and detail are amazing. Colors are rich and while pixelation is kept to a minimum, it creates the only downside to this transfer. Audio Transfer Review: The audio transfer is unfortunately as average as you can get. The front soundstage sounds fine; the left and right speakers handle the music cues as well as they can. But there is very little surround activity throughout the film, and despite the largely hip-hop score, the LFE channel is surprisingly tame. Dialogue is clear and easy to understand for the most part. An English 2.0 track is also provided. Extras Review: Director Gina Prince-Blythewood participates in two commentary tracks on the disc and each are worth a listen. The first features Prince-Blythewood and actress Sanaa Lathan and it is a funny and interesting track. The second is a more technical, with editor Terilyn A Shropshire, composer Terence Blanchard and Prince-Bltyhewood discussing the production side of the film and what choices had to be made to create the film. Blanchard's score plays during the breaks in the track. A selection of 7 deleted scenes is available with or without commentary by the director. Like most deleted scenes, these were obviously taken out for a reason, although they are still worth a look. Audition tapes are also available to view and you can watch the final scene and compare it to the tapes. A blooper section shows a few minutes of outtakes from the film and while they are not drop-dead funny they are still entertaining. Storyboards of the basketball sequences can be viewed with or without the finished product as well. The best supplement is a 37 minute documentary entitled Breaking The Glass Ceiling—The Rise and Acceptance of Woman Competitors. It shows women who have successful jobs and how they have climbed to the top of their professions. A Lucy Pearl music video and the film's original trailer round out the disc. 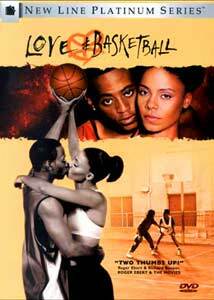 Love & Basketball won't win any major awards but it is worth a look. The performances and writing make this film, and the extras on this special edition DVD sweeten the deal. Rent it and see what you think.